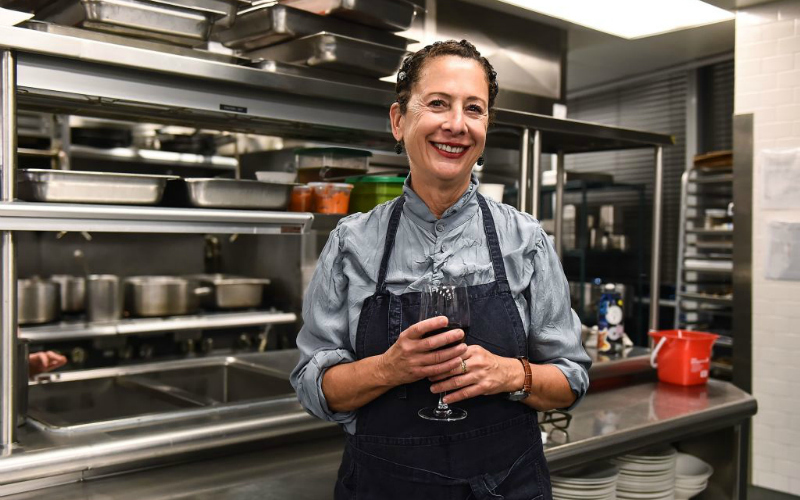 The reigning queen of L.A.’s dining scene looks set to expand her empire. As of July 1, Mario Batali will be fully divested from B&B Hospitality, the restaurant investment group he co-founded with Joe Bastianich, and Nancy Silverton will be stepping into a bigger leadership role within a new version of that company. Among her first orders of business: opening Mozza locations in London and New York City and opening a Los Angeles location of the Las Vegas steakhouse concept Carnevino. Once the current iteration of B&B Hospitality is dissolved, the post-Batali corporation will have Silverton and Joe Bastianich’s mother, the chef and television personality Lidia Bastianich, in more prominent roles, the Washington Post reports. Mario Batali and Nancy Silverton’s first professional collaboration was Osteria Mozza. Initially, Batali had asked Silverton to move to New York to work for him at his restaurant Del Posto, but she turned down the offer and asked him to invest in a place in Los Angeles instead. He initially passed, but when they ran into one another several months later, once she had been inspired to open her signature mozzarella bar, he was convinced, and B&B Hospitality backed her in the venture. From there, they would go on to collaborate on the other Mozza properties and Chi Spacca, Though they worked together for a decade, in our conversation with Silverton earlier this year, she asserted the relationship with Batali was a business one first and foremost, and while he may have acted a mentor, she did not really consider Batali a personal friend. In late 2017, Mario Batali was engulfed in scandal, when several allegations of sexual misconduct were exposed by the media. At the time, in addition to his television shows and branded product lines, Batali was involved with 24 restaurants and the Eataly chain of food hall marketplaces. He was ousted from Eataly in December–Eataly was not part of B&B Hospitality–but the association cast a shadow over the chain’s launch in L.A., which happened just as the allegations were breaking. Since the stories emerged, Batali has largely receded from public life, though an April 2018 story in the New York Times suggested that he may be considering launching a new restaurant company in the future. Were that to happen, it would be completely separate from the Silverton-Bastianich partnership. Next articleThis Artist’s Silk Pajamas Are a Love Letter to L.A.